1. Preheat oven to 400F. Place rack in center of oven. (If you are fancy, try smearing the halved squash with garlic, oil and salt and pepper first). 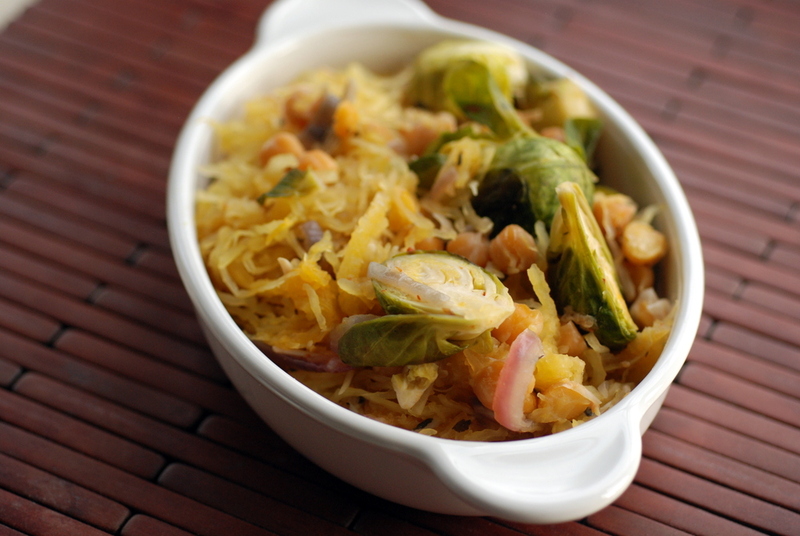 Pierce the spaghetti squash multiple times with a fork or knife. Place on a baking sheet and bake for 30 minutes. Rotate squash and bake another 30 minutes or until the shell feels soft. Remove from oven and set aside until cool enough to handle. Once the squash has cooled, cut it in half and remove and discard the seeds and scrape the strands of squash out with a fork. 2. Meanwhile, prepare the Brussels sprouts. Place trimmed and cut sprouts on a baking sheet, toss with oil and sprinkle with salt and pepper. Add to oven when there are 15 minutes left for the squash. Remove the sprouts when they are just beginning to brown. 3. In a large skillet on medium-high, heat the oil. Once hot, add the onion and saute for 3 minutes. Add enoki mushrooms and continue to saute for a further 3 minutes. The onions should turn golden. Next, add the Brussels sprouts, garlic, and vegetable broth and cover tightly. Cook for 3-5 minutes, adding more broth or water if skillet becomes dry. Add the chickpeas, basil, and red pepper flakes. Stir in the spaghetti squash, and toss gently to mix. Cook until heated through. Add salt and pepper to taste, along with lemon juice. Serve topped with crushed or sliced almonds, if desired. My favorite is “Lazy cat on the treadmill” video as even the cat owner can’t stop laughing. You can only train cats so much and mostly the owners are being trained, not the cats. Thanks for the laughs. Okay, so as if I didn’t already love your blog, you had to really seal the deal with cat stuff! Recipe sounds good (spaghetti squash and b sprouts)—-not sure I love enoki mushrooms—may have to stick with the tried and true baby bellas (little portabellos/creminis, which just happens to be a nickname for our feline princess, Belina (Baby Bella)). And the beer baked fries are seriously tempting. Was going to have burgers later in the week with sweet potato baked fries, but may have to opt for this (if Andy will sacrifice one of his beers for the cause!). I love Belgian stew! Is the recipe you were going to make the one with seitan, Dijon mustard, onions et al? Don’t know how you feel about seitan. We’ve made our own, but I know it’s not exactly a whole food. maybe mushrooms could sub for the seitan? We throw in carrots and mushrooms anyway, even though the reipe doesn’t call for it. Hi Camilla, Thanks! I already linked to your announcement page. I did. Click on “month”. This looks amazing. I’m not a cat video person, but if you don’t mind naughty language, I die laughing every time I watch the Crazy Nastyass Honey Badger. This looks SO GOOD. I want it! I want it! You know, I can’t say I’ve ever even watched a cat video! I’ve obviously been working too hard in lab. Tomorrow’s gonna be all about the cat video distractions! I really don’t use spaghetti squash enough. This has to happen! I think “Surprised Kitty” will always be my favourite cat video. It’s just so cute!!! So yes. Thanks so much for existing life and in the blogosphere! Thanks so much for posting the recipe for the beer soaked baked fries—never would have known about that recipe/blog. usually make sweet potato baked fries, but these are a new favorite (even if not quite as nutritious as sweet potatoes). You’ve got to try them! You’d never know they weren’t fried. It’s like how I remember fries to taste before restaurants started using frozen with little to no seasoning. Healthy, delicious and beautifully photographed as always Janet. I think sprouts in all their forms arer so under rated, possibly as so many people have experienced horrible ovre cooked ones? That sounds like a really good combination of flavours. 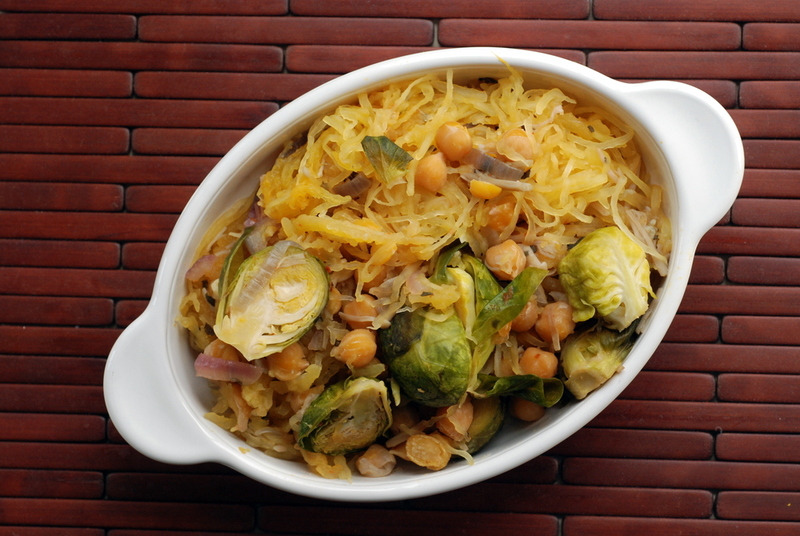 I’ve never used spaghetti squash though – perhaps I’ll have to give it a try! Thanks for entering this into Simple and in Season.